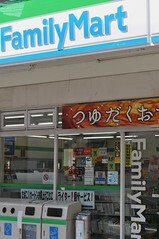 The Pharmaceutical Affairs Law “PAL” was revised to allow convenience stores like 7-11, Lawson, Family Mart or others to sell most over-the-counter drugs, as long as they have a clerk who has registered and qualified with the local government. The fact that they no longer need a pharmacist is a big cost-saving difference from before, that also allows a big new income stream for the conbinis. I’m not sure why, but the same revision to the PAL took the step of banning Internet sales of OTC drugs. The Ministry of Health Labor and Welfare cites the reason that the drugs should be sold with qualified registered clerks in attendance as the reason. While I can’t divine the internal workings of Japanese bureaucracy, on a practical note, if the convenience store has medicine available, you’ll probably see the characters くすり or 薬 in the window. I’ve been waiting for this for years. Having been here since 1987, I remember going back to the US and noticing you could always buy things like Tylenol and Pepto Bismol at the 7-11, but the day has finally come in Japan.